Southern Classics is the inspiration behind the Old Forester’s Birthday Bourbon Dinner Menu. Chef Ashley Felder has created a southern comfort menu, which, when paired with the differing styles of Old Forester’s Bourbon, will warm your soul. By the end of this fabulous evening, you will be blessing everyone’s heart and planning a trip to the Kentucky Derby. We’ll begin with an Old Forester 86, paired with Pimento Cheese Deviled Eggs. From there, we will enjoy a Manhattan made with Old Forester 1897 Bottled in Bond and delicious Carolina Bar BQ Sliders. Dessert will be an old fashioned Peach Cobbler served with an Old Forester 1920 Highball. 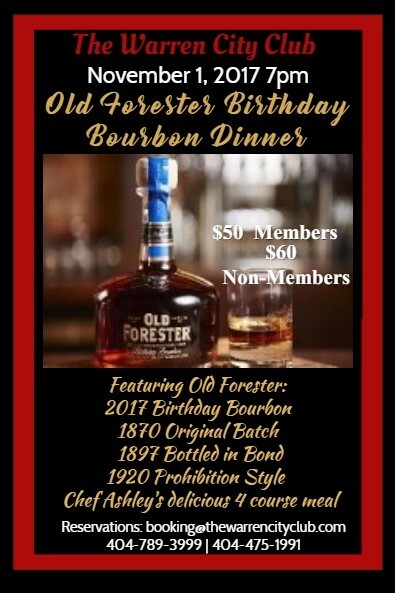 Dinner will finish with a taste of the limited release and highly coveted 2017 Old Forester Birthday Bourbon.